The host interface provides connection between the array controller and SCSI host system. ULTRA Wide synchronous transfer provides 40 MB/sec sustained data transfer rate. High Voltage Differential (HVD) SCSI interface. 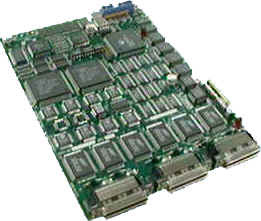 The array interface provides connection between the array controller and SCSI optical drives. Five independent parallel SE Wide SCSI channels provide 20 MB/sec sustained data transfer rate for each array channel. Compatible with all SCSI optical drives including DVD-RAM and Magneto-Optical (MO).